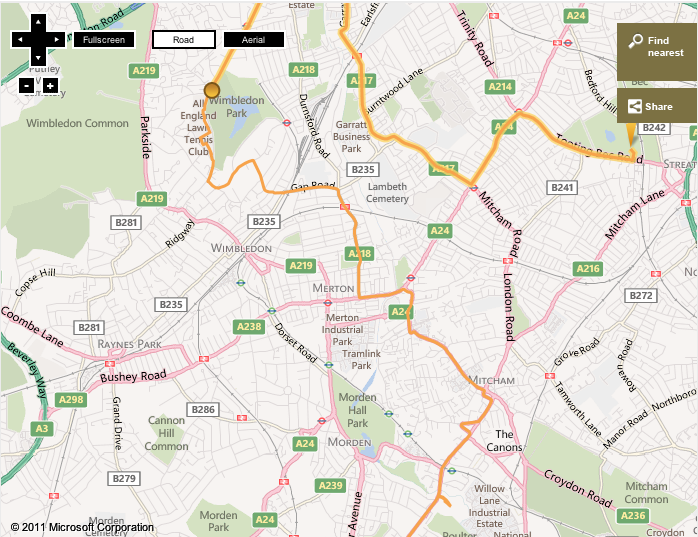 In an uncharacteristic moment of Olympic zeal, Grumpy announced a plan: to walk the Merton section of the Olympic Torch Relay route. For those without local knowledge, Merton is a borough of South West London. London 2012.com indicated some time ago that 95% of the British population would come within 10 miles of the Olympic Flame, and, to be fair to them, they seem to be bringing it past the end of our road. While not being fully cognisant of the significance that this event may hold for us in the future, Grumpy was keen to see where else the torch was going in our manor. In particular, he wondered what sights the torch bearers would see as they traversed Merton, from Mitcham to Wimbledon Park, and urged me to document our journey as we pre-lived the torch relay. As the local Guardian reported recently, none of the torch bearers lugging the flame through the borough appear to be actually from Merton. Some of them are from quite exotic locations: a couple are from the States, Georgia and San Francisco and one of them is from Rio de Janeiro in Brazil, the host city of the next Olympics. Hopefully, this blog will help them prepare for the sights they will encounter on their route. Merton has quite a lot of what you might normally expect to be out-of-town shopping centres, only in Merton they are pretty much in town. One of the first the runners will pass is the Tandem Centre, scene of London rioting last summer. JD Sports was hit hard, giving perhaps an indication of the thirst for sports, or at least sports clothing among the locals. The shops have had their windows reglazed, so it looks quite nice again and Grumpy was keen to record this leg of the route. 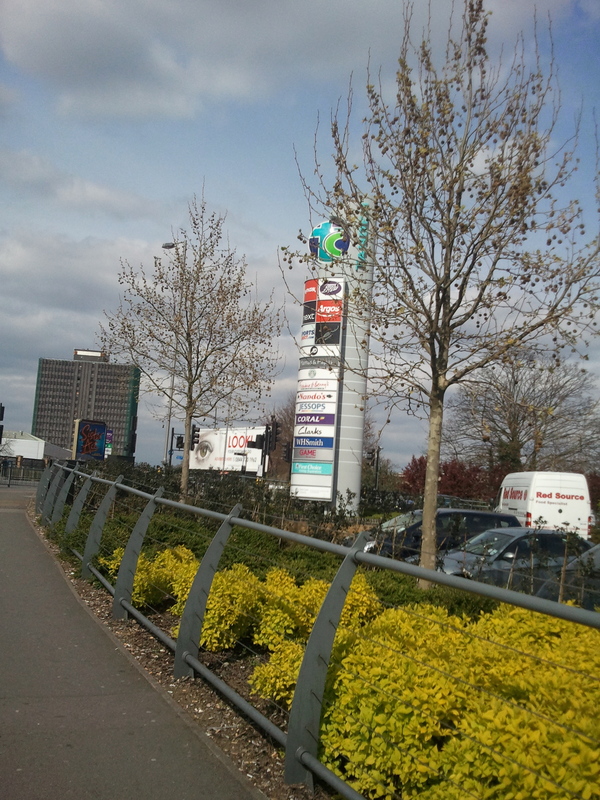 Further down on the opposite side of the road, the torch bearer will swing round another one – the Priory Retail Park – before catching a monumental glimpse of one of our most iconic buildings, The Black Tower, dubbed among the most ugly in the land (you can just about see it in the Tandem Centre photo above). 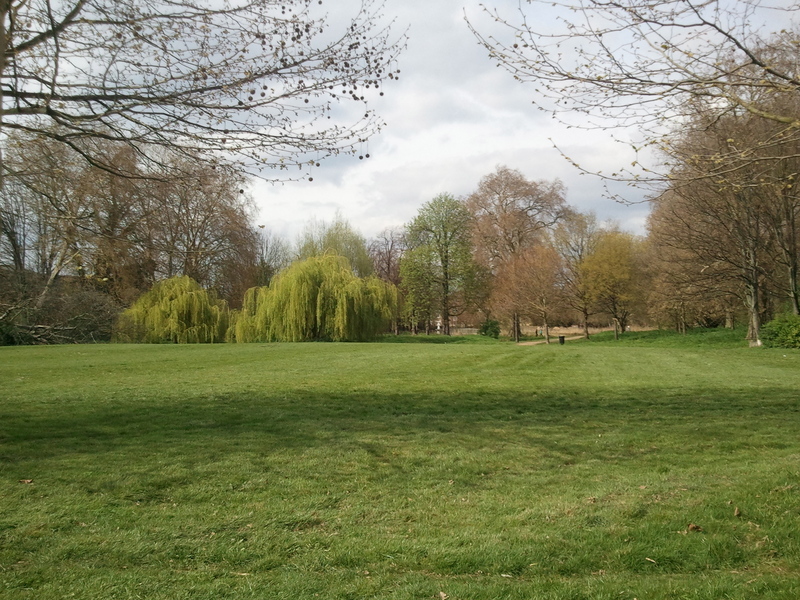 Grumpy was certain that the tranquil scenes of Wandle Park would soothe the appointed runner, however, before he or she passes another retail landmark the SavaCentre, built on the site of the 12th Century Merton Priory. Not only do we have Sainsburys, but a few years ago, a flagship M&S store opened up here too. Grumpy expressed a bit of concern about whether the torch relay was going to impede him getting his dinner, what with all the crowds. I suggested that maybe we could go shopping a bit earlier that day. The Merton relay doesn’t get going until about 3pm. The next section of the route took us all the way along Haydons Road, which is a bit lacking in photographic opportunities. So, as we walked we discussed Olympic related themes. I wondered if Grumpy had heard about the controversy over the £199 price tag that the lucky bearers are being quoted to keep the torch in their possession after the event. He was taken aback at first, “I didn’t know you had to pay to be in the torch relay. I thought you were nominated”. I reassured him that no-one was being forced to pay, just invited, and that anyway, the actual cost of the torch is nearly twice as much at £495. I did a quick calculation: if there are 8,000 torch bearers that makes … nearly 4 million quid! On reflection, Grumpy and I wondered if it would have been better to pass the torch rather than the flame (that is, after all, what we had thought they did anyway). We also chatted about a story I read in the London Evening Standard about Olympics Minister, Hugh Robertson inciting Londoners to shop their neighbours if they overhear plans to disrupt the celebrations by protesting. Luckily, the Minister also noted that the right to peaceful protest was enshrined in English law. Quite ironic really, since, not far from where we were walking, down by the river in Putney, the Oxford and Cambridge Boat Race was being hijacked by protesters. Everyone seems to have made the link to what might happen during the Games. 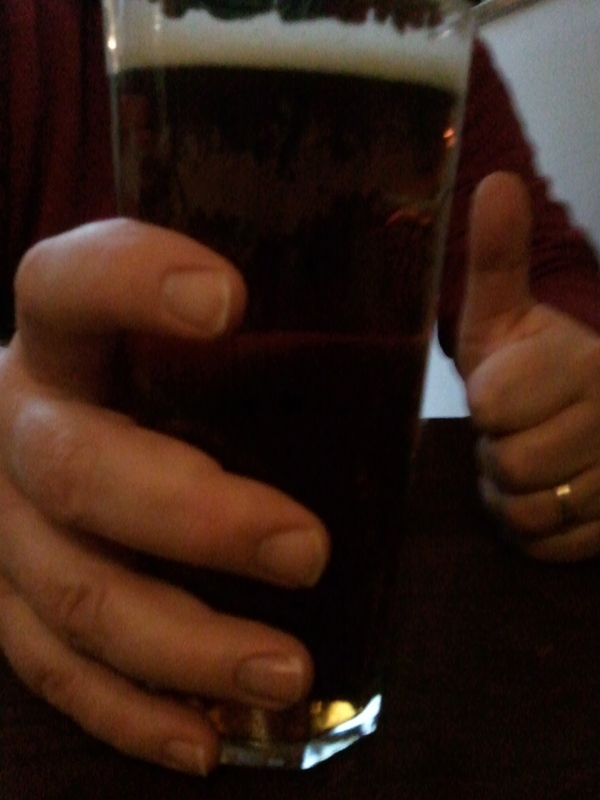 Just see it as civil engagement, I say. People are taking an interest, after all. 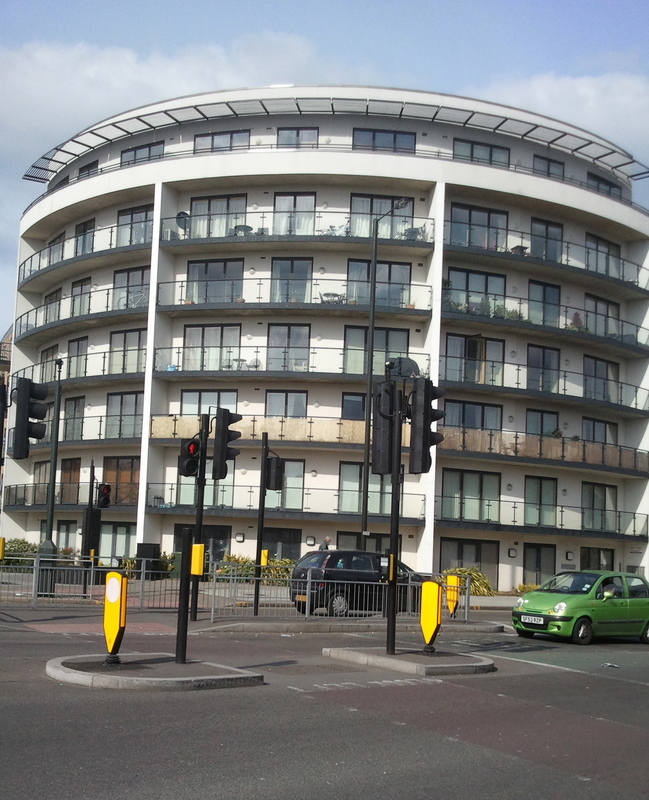 Passing the corner of Plough Lane, Grumpy and I spared a moment to remember the former site of Wimbledon Football Club. The football ground is now no more, replaced by fancy flats, and the club relocated to Milton Keynes. Never mind, now we have AFC Wimbledon, born from the ashes and steadily climbing the leagues. Grumpy is a fan and takes the bus to Kingston to see them play at the Cherry Red Records Stadium. 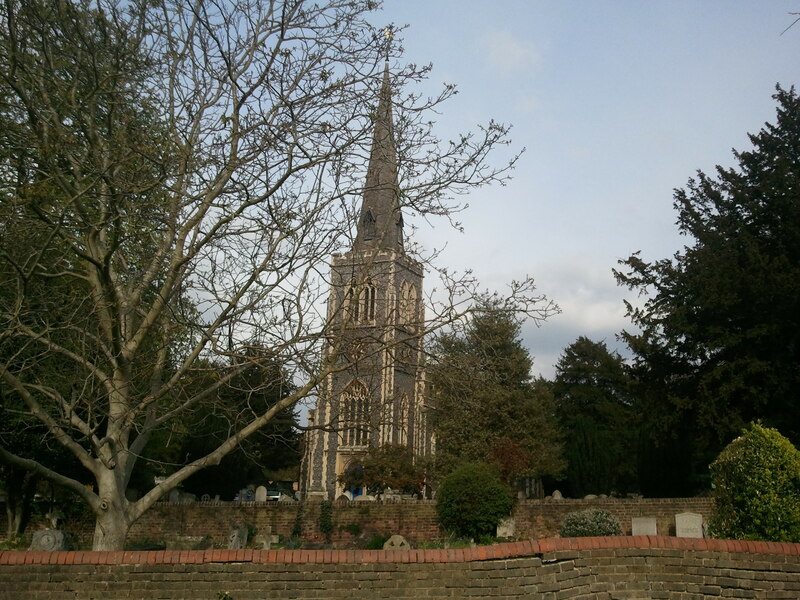 Turning into the Wimbledon Park area, we left the traffic fumes behind and came upon some more salubrious sights, including St Mary’s Church. There is a record of a church on this site in the Doomsday book in 1086, so that will lift someone’s spirits. They are going to need it, because whoever gets the Leopold Road section of the run has drawn the short straw – there’s a bit of an incline, so be warned. Grumpy announced his worry that the torch bearers might not be training sufficiently. “That would be embarrassing”, he reflected. I said I thought it would be alright. 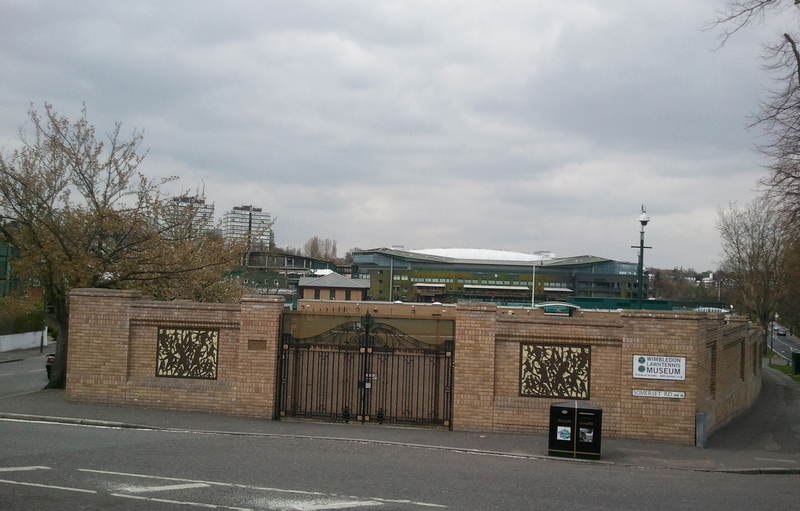 Finally, we made it to the grand finale, the All England Lawn Tennis Club, known worldwide as Wimbledon. We studied our map of the torch route, and it looked like it actually goes inside the club itself. Every time I have been inside, there has been a security guard accompanying me. They seem to be a bit over-worried about what you are going to do. Or maybe it’s personal? Anyway, I wonder whether they’ll be enough people watching to make sure the lucky bearer does not divert from the designated route. This entry was posted in Torch Relay and tagged black tower, colliers wood, london 2012, london olympics, merton, Olympic torch relay route, savacentre, tandem centre, torch relay, wimbledon by Eileen Kennedy. Bookmark the permalink. that was very entertaining, and informative. I’d thought there would be just one torch, passed from hand to hand along the route. Are you telling us that there are as many torches as torch bearers? How many would that be? Hold on! Stop press – the BBC says Premier Group, the company in Coventry that is making them, has an order for 11,150 torches. There still appear to be only 8,000 runners though, because the torch has a hole punched for each one, and that’s 8,000 holes. What are they going to do with the others? It does look nice, though!